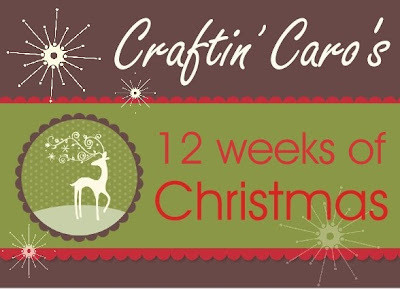 Coming October 1 -- the 12 weeks of Christmas! Yes, it's that time of year again -- get ready for the 12 weeks of Christmas Christmas campaign. 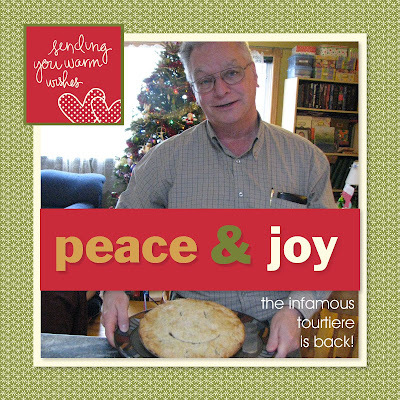 Twelve fantastic holiday ideas to make the season brighter - my holiday gift to you! This is a special subscribers-only special, so if you are already signed up for my newsletter, you need do nothing. If you aren’t on my newsletter, then you’ll want to be! Be sure to join my e-newsletter list today so that you get your weekly email with holiday cards and gift ideas inside! Stampin' Palooza -- just days away! If you think my life hasn't been busy enough, throw in the fact that I'm hosting the big "Stampin' Palooza" event for 185 people this weekend, and you might see why I'm not the fastest at answering my emails these days! LOL! 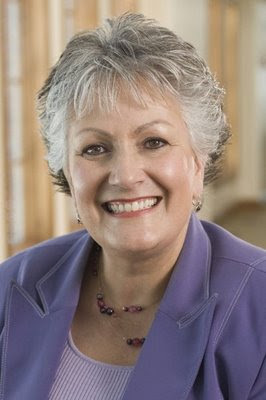 One of the most exciting parts of this event is the fact that the most fabulous LINDA HANSEN will be presenting to us! I just *heart* Linda so much, and feel incredibly blessed to have her travel to us from Utah for the weekend. YIPEEEE!! 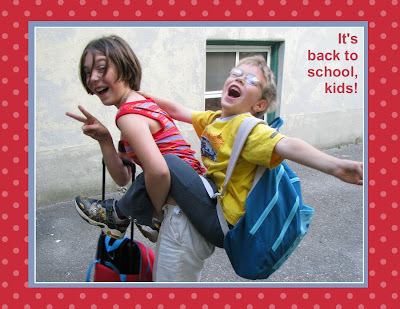 If you are attending 'Palooza, be sure to read my REMINDER EMAIL here! My Digital Studio -- calendars! One cool feature about MDS is the ability to create customized calendars with it. I think it's great that once I'm done, I'll be able to get Stampin' Up! 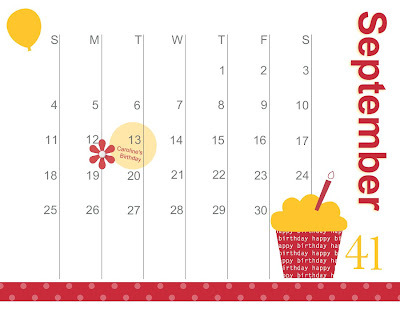 to print the entire calendar afterwards and have it wire-bound, all the better to give as gifts! Want to learn more about MDS? Please click HERE to see a quick video from Stampin' Up!, helping explain the ease and versatility of My Digital Studio! THEN, you NEED to check out this brilliant video from the incomparable Patty Bennett. 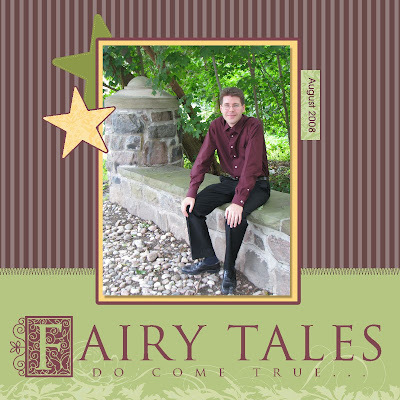 She created an 8x8 book that shows all the cool embellishments and ways you can use MDS, and created a slideshow that she posted on YouTube. I think this is an inspired idea and plan on doing something similar too. Don't you think she's brilliant? 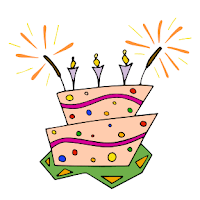 Last chance for Birthday FREE S&H plus more MDS pages! A quickie reminder to all my friends out there in blog-land that September is almost over, and that means my free S&H birthday special will be ending too! Be sure to get any last minute orders in to me while you can and save $$$$! I'm back again today with even MORE layouts for you as I continue to explore the world of digital scrapbooking. Both of these pages were adapted from pre-made layouts using the "Rock-a-bye-baby" scrappin' kit, which is included in the MDS program. I simply popped my photos in and then played with the embellishments, stamps as I much as I wanted to! Nothing baby-ish in these pages, right? That's part of the beauty of MDS -- its sheer adaptability in changing whatever elements you like! If you would like to know more about this product, please drop me a line anytime. "My Digital Studio" pre-order special -- over 25% off! Woowee! How can anyone resist it? Stampin' Up! 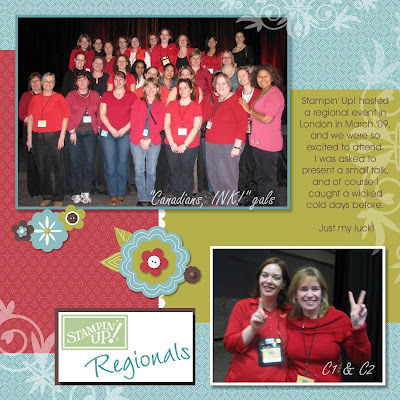 's new My Digital Studio is not just about digital scrapbooking.. no, siree! You can make cards, photo albums, calendars, interactive projects, DVDs, movies, and export to .jpg for other projects! For the following 4 layouts, I adapted pre-made pages from the "Summer Home" Simply Scrappin' kit that is included in the MDS software package. This was one of my favourite SS kits from the past, and it uses one of the best SU "In Colors" EVER -- Baja Breeze. What a joy to play with it, Kiwi Kiss and Riding Hood Red again! I then selected a different pre-made page layout from the same Simply Scrappin' set, but this time adapted it to an outdoor garden wedding! 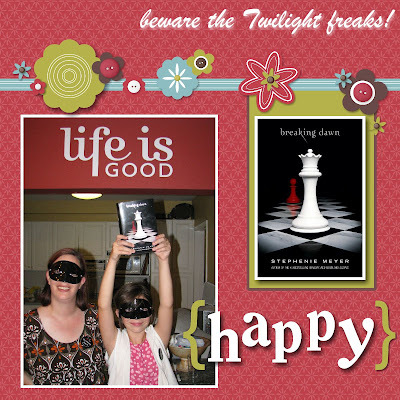 And once again, using the same kit but to do a goofy page on when we went out to get the new "Breaking Dawn" book together... See how adaptable that one kit is? You can see the rest of my MDS posts by clicking HERE. DO YOU HAVE QUESTIONS? I HAVE ANSWERS! Q1 . Will this work on my computer? If you have a Mac or PC, you're set! You can read more about the system requirements here. Q2. Are all the recent pages on my blog from this program? Yes--I've only used the pieces that come with the program so far, and I've barely scratched the surface of the possibilities! 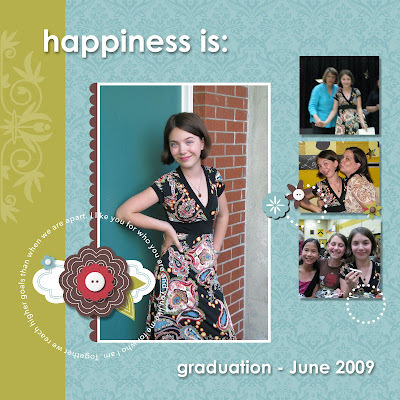 My Digital Studio comes with over 2,000 images, including card stock, designer series paper, punches, stamps, and all kinds of embellishments from our product line, making it so easy to make hybrid scrapbook pages since everything matches our real-life products. Just print and embellish! Q3. How much is it? The program normally costs $106.95, which is already a fantastic value. Other digital design programs that do similar things can cost upwards of several hundred dollars. 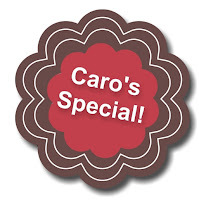 Plus My Digital Studio contains the fabulous Stampin' Up! artwork and colours that you already know and love. However, my special pre-order price is only $80 CDN if you order it from me on October 1 when it's released -- that's over 25% savings! Please note that this offer will only be valid until Monday October 5, 2009. Q4. How do I get My Digital Studio for half-price? When you host a workshop or a book party that totals $550 or more during October, you can order My Digital Studio at 50% off! My Digital Studio (or MDS as we like to call it) will be available for purchase beginning October 1st, excluding Québec. If you'd like to find out more or even set up a hands-on demonstration, please give me a call at (416) 694-4074 so I can help. 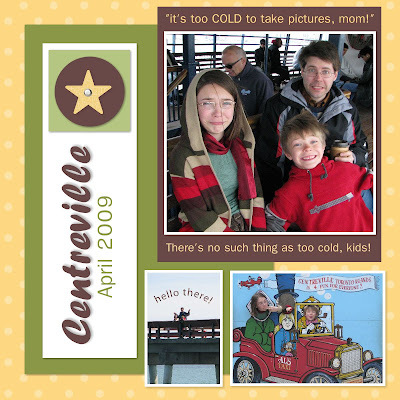 Here was a fast and easy 12x12 Christmas page I made using My Digital Studio, using a favourite old family photo. Let me tell you, the smiling tourtiere is definitely a LeBel family tradition! 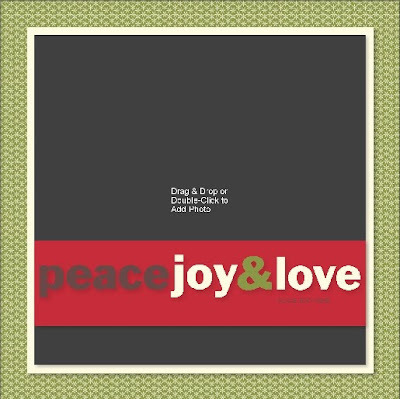 To make this layout, I just selected one of the pre-made template options (see below) from the Christmas Simply Scrappin' kit that's included in it, and changed a few things to better fit my photo. The black area auto-fills with your photo, and you can just go from there! I'm amazed at how easy it's going to be for me to catch up on my scrapping... and trust me, I have A LOT of catching up to do. If you think that YOU'D be interesting in picking up your own copy of MDS when it's released on October 1, watch for my special pre-order special that will be announced tomorrow! 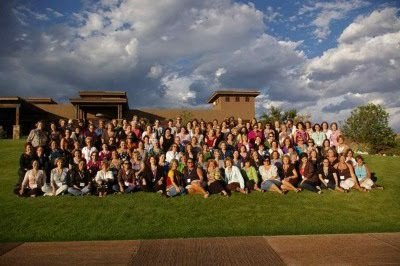 2 group shots from Founders Circle -- thanks, Shelli! My bad... I'm "borrowing" these 2 official shots from Shelli's blog, since it will be a while before we get our hard copies of the group pictures they took of us. 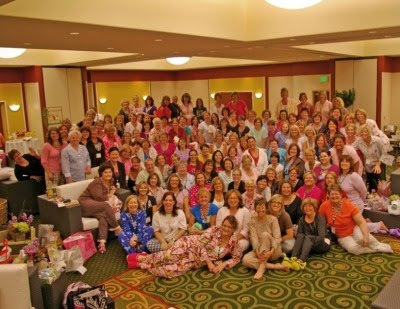 This first one was from our Pyjama Party -- I'm in the white t-shirt, first row. ...and this one was the final evening's dinner reception at the golf club -- BEFORE the crazy storm blew in! I've managed to get all my FC photos posted, so if you are interested in seeing them, you're welcome to take a peek! In the spirit of sharing, here are 4 more cards from this weekend's upcoming Holiday 10 card class! Due to some re-shuffling of class attendees, I can now accomodate a few more people for either the 10am, 1pm or 4pm spots. Please let me know if you want to pop by! Trees are a popular image for holiday cards, and I've always been a sucker for them. Classic, whimsical, ornate or simple... I like them all! With that thought in mind, here are 4 of the 10 cards we'll be making this Saturday as part of my Holiday Cards class series. "Thoughts & Prayers", and my very own idea for a change! 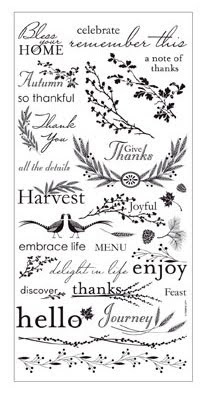 "Autumn Harvest" Rub-ons card class! 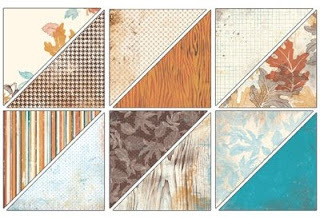 Here is a sneak peek at the cards we'll be making at Thursday's "Autumn Harvest" Rub-ons class. I always enjoy putting these kind of classes together because rub-ons are so easy to use. This particular set has 2 sheets per package: one sheet with Chocolate Chip images, and one sheet with Whisper White images. Everyone who attends the class will receive their own "Autumn Harvest" rub-ons set to work with and then keep the left-overs, and then make 4 cards with Earth Elements cardstock and the new "Autumn Meadows" Designer Papers. If you'd like to attend, just drop me a line! The Big Shot and Quilting! While I was at the Founders Circle retreat last week, I saw some of the most BEAUTIFUL quilts ever -- and they were all embellished using fabric & dies in the Big Shot! Now, if you think those were cool, DEFINITELY check out the picture's that my US demo friend Lisa Freeman posted on her blog here -- those Big Shot quilts are also WICKED cool! Home sweet home and MORE birthday cards! I flew back into Toronto last night from my amazing Founders Circle trip adeventure, and arrived home at midnight, pooped but excited to be home with my family! I have *so* many fabulous ideas and swap cards to show you now that I'm home, plus I just had to add some more exciting classes to my schedule... such as a "Sweet Treats" Shaker card class that will be held on Friday November 28th, using the "Sweet Centres" set from the Holiday mini catalogue. I'm also adding a "Bag it, Box it, Tag it!" class in December and a Holiday Marketplace night for you to pick up hand-stamped items and kits to make things as gifts for the holidays! For now, here are 3 more beautiful cards that were waiting for me from Janis, Katherine and Michelle!